Michigan summers do a great job of bringing people out-of-doors. Schools starts soon and so I’m thinking back about all the fun that I had. I truly hope that you were busy having as much fun as I did. Our Trails Towns of Milford, Dexter, Ann Arbor, Ypsilanti, and Flat Rock were filled with wonderful events all summer long. I had planned to golf more, ride my bike daily, and plant some new flower beds, but instead I . . .
* Paddled my kayak and pedaled my bike from Flat Rock to Oakwoods Nature Center on National Trails Day in June. * Visited every fun display and enjoyed watching kids play in the sand area at Huron River Days in Ann Arbor’s Gallup Park. There were plenty of kayakers and handmade kayaks to see. What a busy day on the River! * Bought kettle corn, set up a lawn chair, and enjoyed outside dining in Milford as part of their Farmers Market and Concert Series. I had such a good time, I went twice! How exciting their Amphitheater at Central Park along the River is under construction! * Enjoyed a great BBQ dinner and root beer float at Dexter Daze. I had a great time visiting with all kinds of people to share fun facts about the Huron River Water Trail and promoting our Super Moon Paddle. 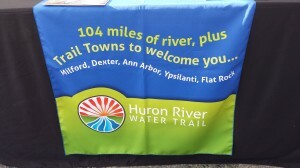 * Walked across the “tridge” and marveled how pretty the Huron is in Ypsilanti during Heritage Days in Riverside Park. A hidden gem. I had great fun selling kayak raffle tickets and seeing the happy winner! 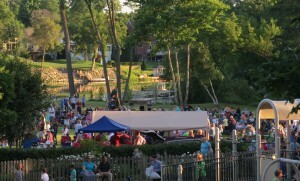 It is a wonderful community event that brings together all of Ypsilanti with festivities. The fun isn’t over yet! Flat Rock Riverfest is coming up from September 19 to 21 at HuRoc Park. With fall on its way, you’ll find me with a cup of hot apple cider, relaxing, and watching the leaves fall. Our Trail Towns on the 104-mile will put on a spectacular display. I’m sure that we won’t be disappointed.